The tradition of opening each issue with a song, continues. This one is largely about Cyclops – which is nice. This issue picks up where the last issue ended, with the Guardians of the Galaxy becoming the third group for the twins to choose from. 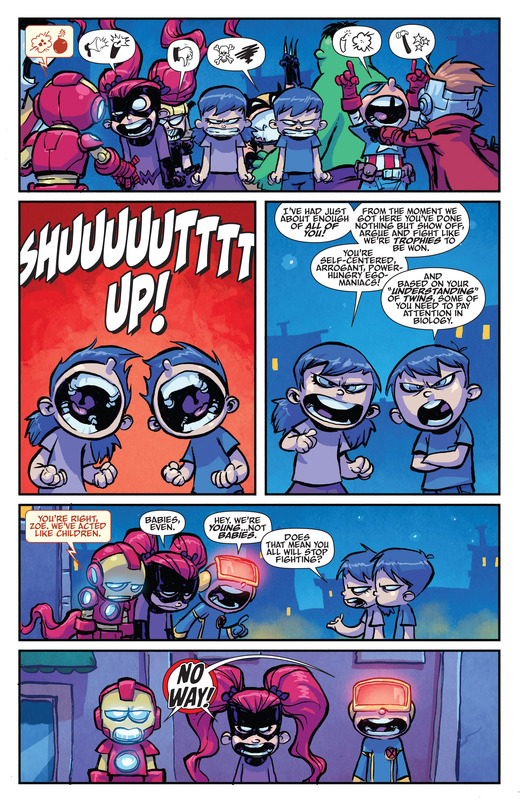 Cyclops and Iron Man are yelling at each other. The X-Men turned the twins into temporary mutants, when they were like that, they broke Iron Man’s new suit of armor. Captain America shows everyone that Wolverine is an Avenger. This annoys Cyclops, so much! Check out that look from Cyclops to the ashamed Wolverine, so great. We get the impression that the Guardians are not going to fight anyone, for the twins. Iron Man asks the twins who they want to join. Just then, a fourth group arrives. The pull out ads are for – Extraordinary X-Men, Guardians of the Galaxy, Spider-Gwen, Spider-Woman and Silk. Pretty decent synergy with the Spider-Folks being the inside fold. I’m only interested in the first two issues but I’m super interested in them. The Inhumans have arrived. There are a couple I don’t recognize. I do know Lockjaw, Triton (I had to look it up, but it is like the father in Little Mermaid), Black Bolt and Gorgon. So I don’t recognize anyone on the right side of the page. The Inhumans are the Royal Family of Marville. 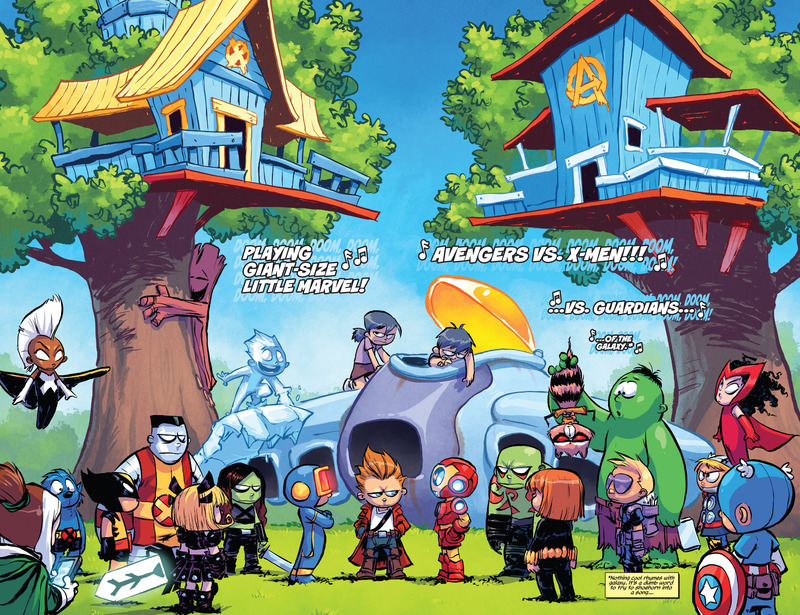 The Inhumans tree house is right next door to the Avengers, making them the middle tree house. Cyclops is not impress, and I’m not either. Cyclops, who is very funny in this series, goes on about how the Inhumans like to say the word, Royal, as much as possible. Medusa will use the word, at least ten more times, before the issue is over. Good for Lockjaw for not allowing Medusa to further hurt Cyclops, good dog! 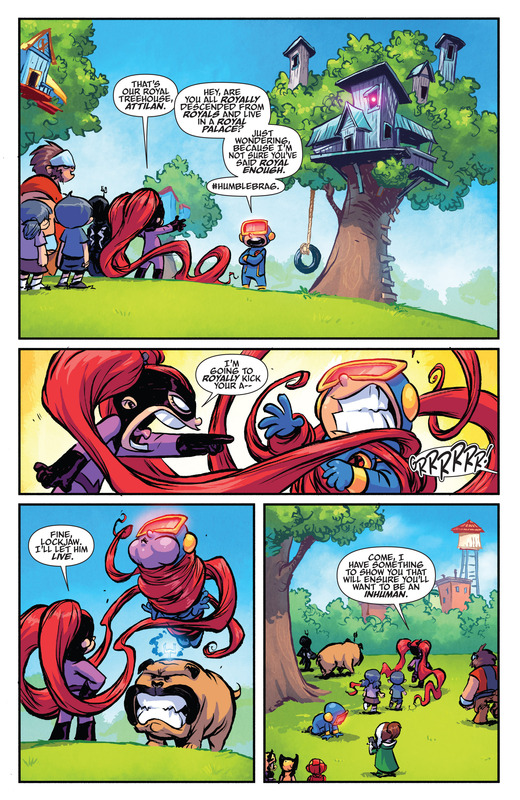 Medusa wants to show the twins something that will prove that the Inhumans are the group to join. 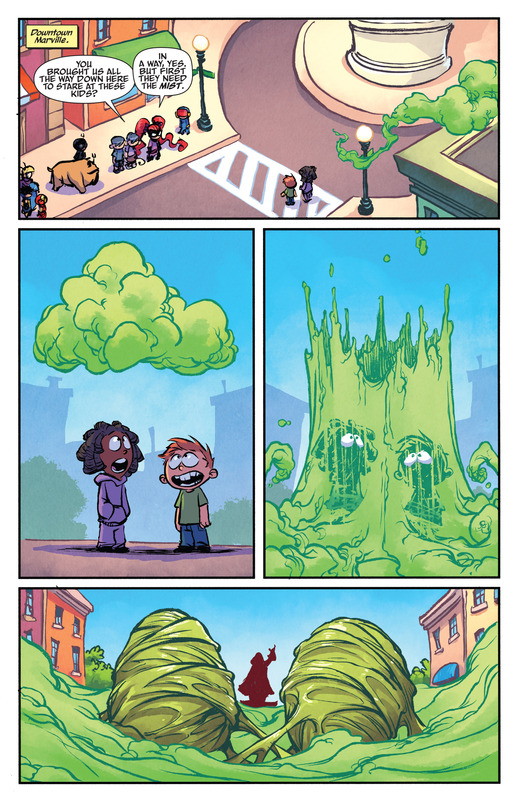 This sequence is so great. 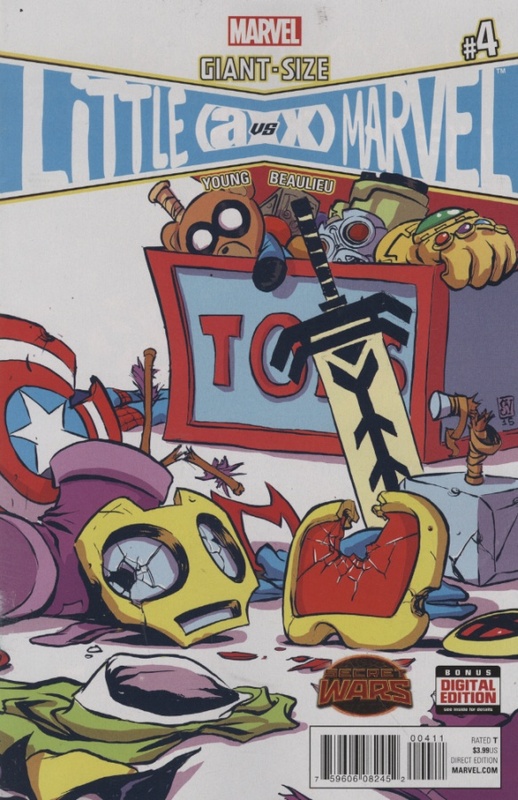 Skottie Young gets to really lampoon Inhumanity. The combined kids come across two unsuspecting kids. A green cloud downpours on top of them, and they are in those green eggs, from the crossover. 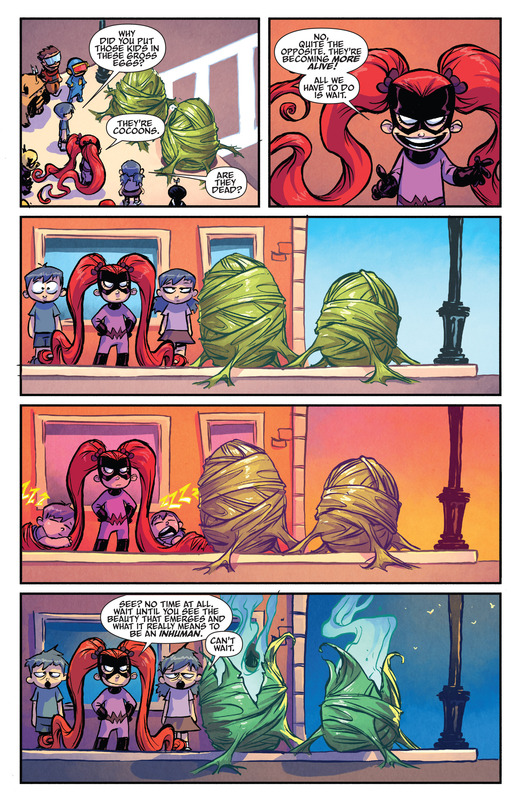 I love how pleased Medusa is, and then how much this will eventually backfire on her. It takes so long for the kids to hatch out of the cocoons. Those poor two children, they are now Inhumans, gorgeous looking Inhumans. The twins want the newly created Inhumans to be set on fire. Cyclops and Magik are laughing so hard, this was the worst decision the Inhumans could have made. Black Bolt does not like the laughter at all, probably due to being jealous that they can even let out a chuckle. Black Bolt screams at Cyclops, knocking him a great distance, into a statue of God Doom. 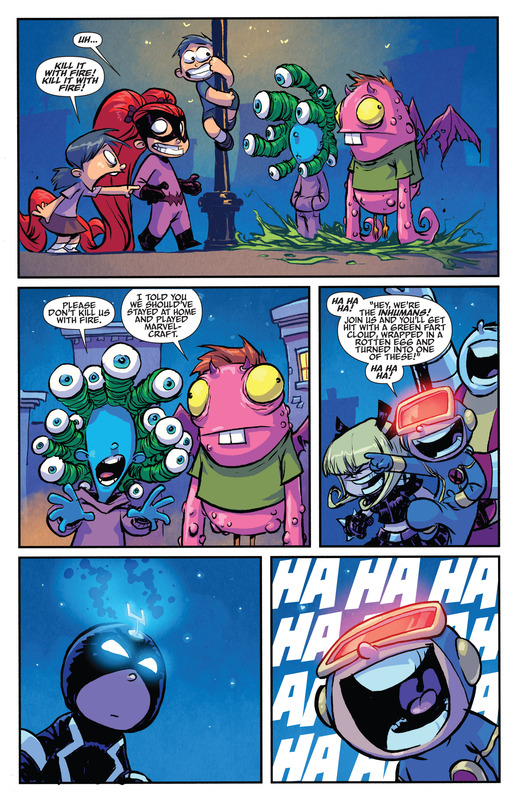 Poor Scott is messed up, and to make matters worst, Doom’s head falls off and lands on Scott’s noggin. 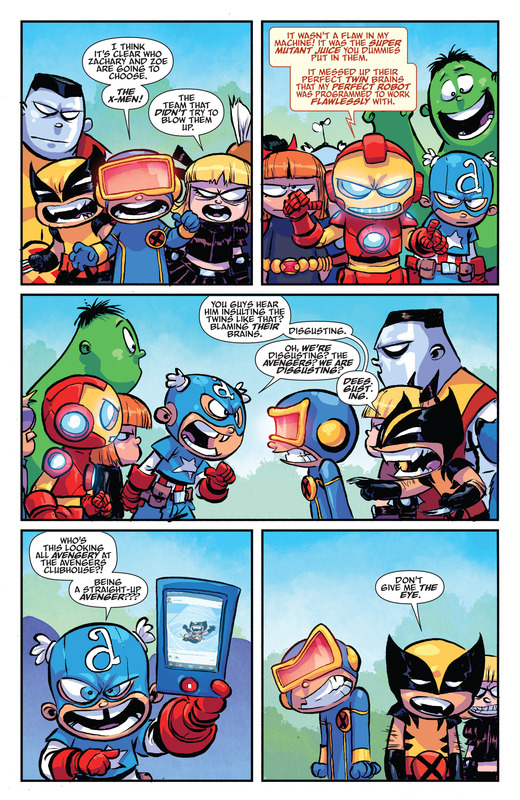 This brings the Avengers and the X-Men together, as Black Bolt was way over the line. 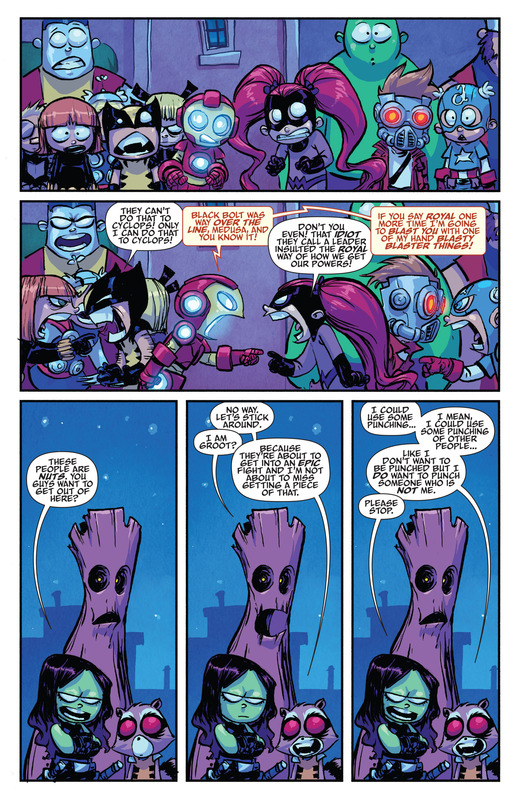 The Guardians really don’t have any interest, anymore, in any of this. Everyone starts yelling at each other. The twins want this to stop, as they have no interest in any of the four fractions. The kid heroes are not done fighting, at all. We are treated to an epic double splash page sequence. Marvel has to sell this as a poster! It is amazing! There are so many great match ups. Everyone else seems to be floating in space but involved in one sided fights, that I can’t quite make out who they are directed at. The other pull out ad is for Invincible Iron Man 1 & 2 with Spider-Man 2099 and Chewbacca, four titles I can’t even bring myself to be interested in. Though Gerry Duggan and Phil Noto, on Chewbacca, is a good creative team. Zoe closes her eyes and is about to randomly picked a group, when a blur picks up the twins. There is a fifth group! Magneto was the blur and he welcomes them to the Brotherhood of Evil Mutants. Loki points out that they are not mutants, so they should go by – Brotherhood of Evil. Mystique points out that they are not all dudes, so they should go by – Fellowship of Evil. Except, she doesn’t like how ‘Fellowship’ sounds boyish. The twins look like they should be somebody, in red shirts and tights with black boots, gloves, shorts, capes and masks. The Zs make me think they are, Fenris, Baron Strucker’s children. That isn’t it though, but it is interesting that Fenris’ first names start with A and these twins are Z names.